Speed 20 ft., burrow 20 ft.
Earth Glide. The xorn can burrow through nonmagical, unworked earth and stone. While doing so, the xorn doesn't disturb the material it moves through. Stone Camouflage. 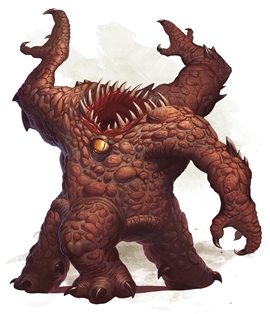 The xorn has advantage on Dexterity (Stealth) checks made to hide in rocky terrain. Treasure Sense. The xorn can pinpoint, by scent, the location of precious metals and stones, such as coins and gems, within 60 feet of it. Multiattack. The xorn makes three claw attacks and one bite attack. Claw. Melee Weapon Attack: +6 to hit, reach 5 ft., one target. Hit: 6 (1d6 + 3) slashing damage. Bite. Melee Weapon Attack: +6 to hit, reach 5 ft., one target. Hit: 13 (3d6 + 3) piercing damage.